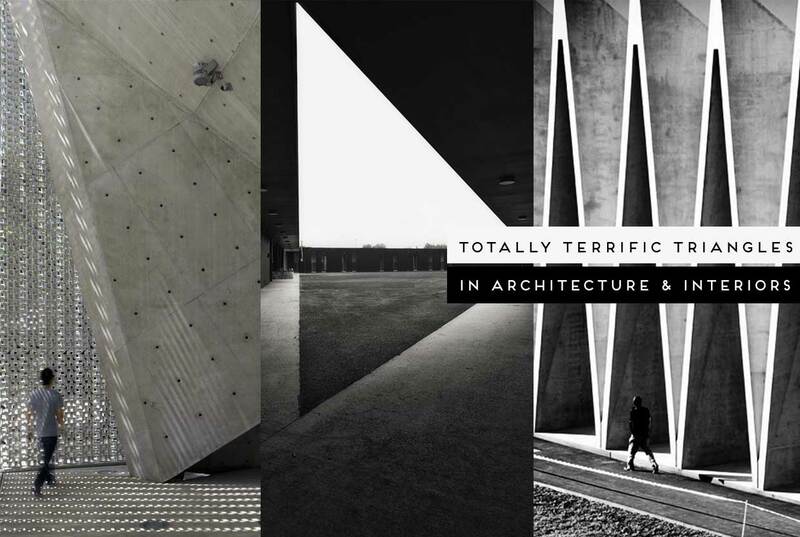 Totally Terrific Triangles in Architecture & Interiors. I have a serious weakness for pure forms and simple geometry. What? 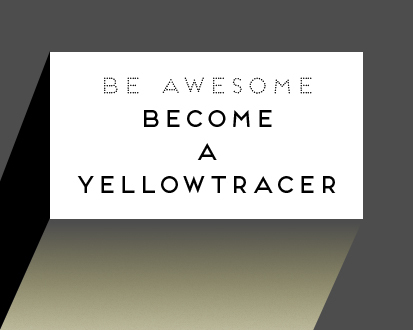 You knew that already? I know, I’m becoming super predictable. Having said that, as much as I cannot get passed squares, rectangles, circles and hexagons (my personal favourites), I’ve had a slight level of resistance towards triangles. Not the equilateral variety of-course – they are cool, it’s those strange ones with irregular angles. They completely freak me out. Why? Because I like my lines aligned and my angles rationalised. I like visual order dammit! Is that so wrong? Alas, today we are here to talk about all sorts of Triangles – the good, the bad, and the ugly. Love-em or hate-em, triangles have an innate ability to make things pretty bloody dynamic. I wouldn’t call them a friendly shape though. No sir. Triangles are warriors. Fighters. They can feel really uncomfortable and aggressive. Other times they are simply assertive. They can also feel stoic and dignified. One thing I do love about triangles is that they are the ultimate geometry chameleon. With them it is possible to achieve a myriad of changing patterns and delicious architectural tapestries. So let’s take a closer look at some triangle triumphs from all over the world. From folds, facets, slanted and triangulated masses, some of these triangular structures take engineering gymnastics to the next level. Others are more polite, two-dimensional explorations of pattern play – from now on I shall refer to them as Love Triangles. P.S. the second related post is the exact opposite of this one, so they are kind of related by being unrelated. Geddit? 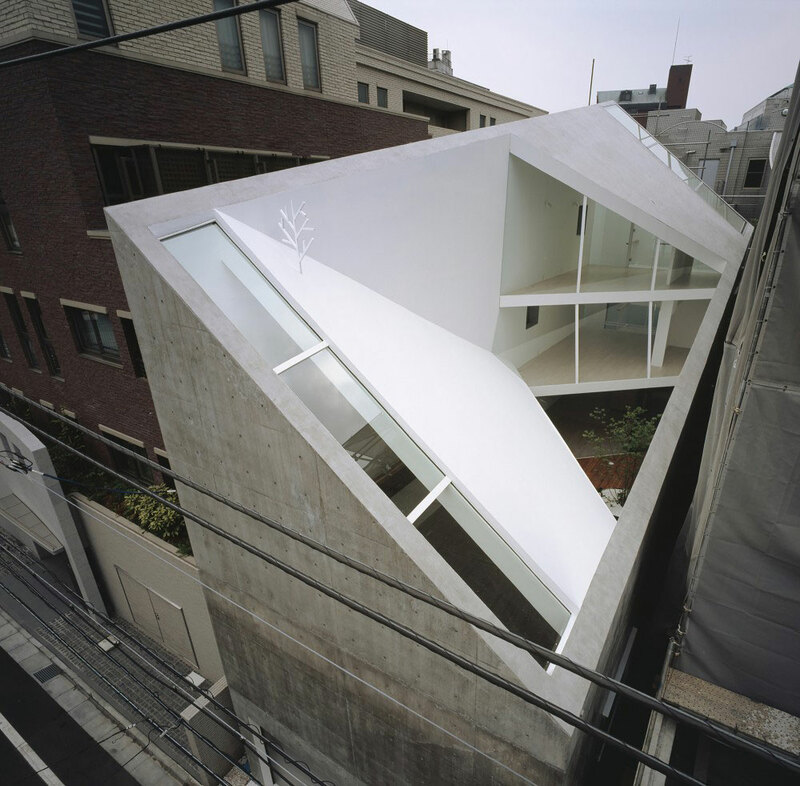 ORIGAMI HOUSE BY TSC ARCHITECTS // MIE, JAPAN. Images courtesy of . Photography by Masato Kawano. 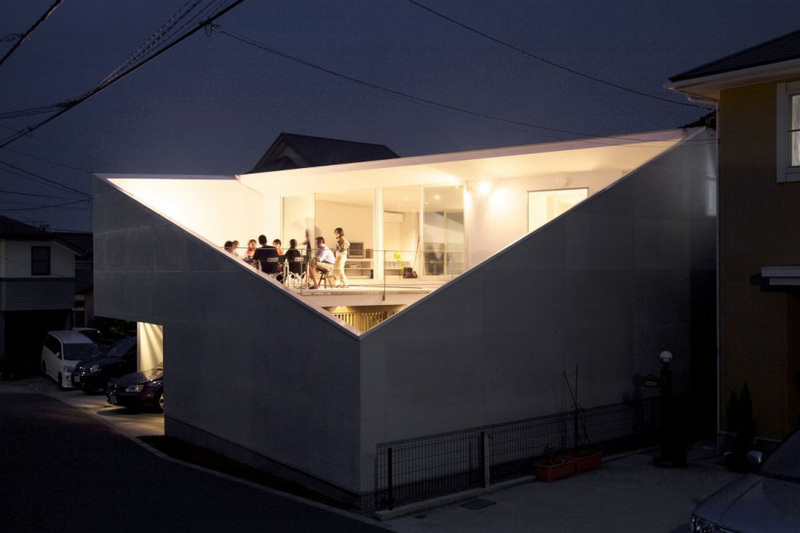 The ORIGAMI roof stands from the earth like a tent and creates tolerant space and protects the life of the family. 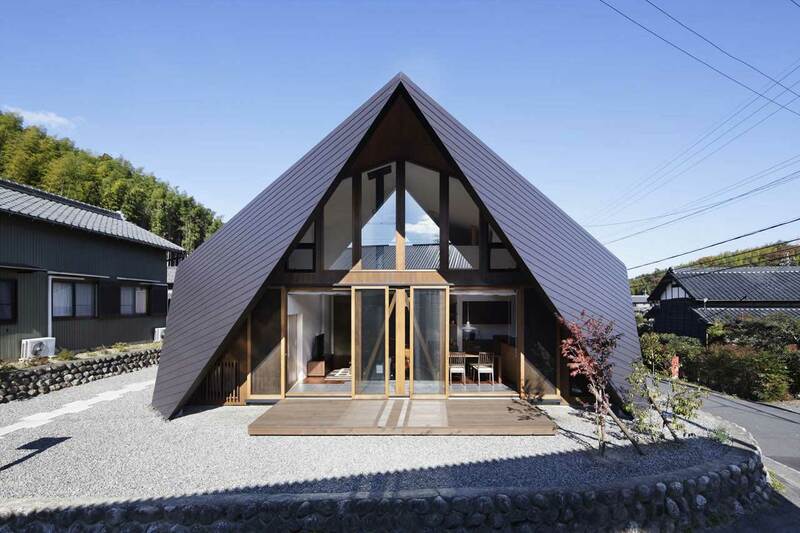 In addition, the ORIGAMI roof has various functions. It controls sunlight and takes in wind and creates half of the outdoor space. This house creates new scenery while inheriting the memory of the village . THE-CUBE / THE OLD MARKET SQUARE STAGE BY 546879 ARCHITECTURE // CANADA. ‘The Cube’ is a dynamic, outdoor, live entertainment venue that takes full advantage of powerful and solid triangular forms offset with delicate perforated screens. THE TEATRINO OF PALAZZO GRASSI BY TADAO ANDO // VENICE, ITALY. 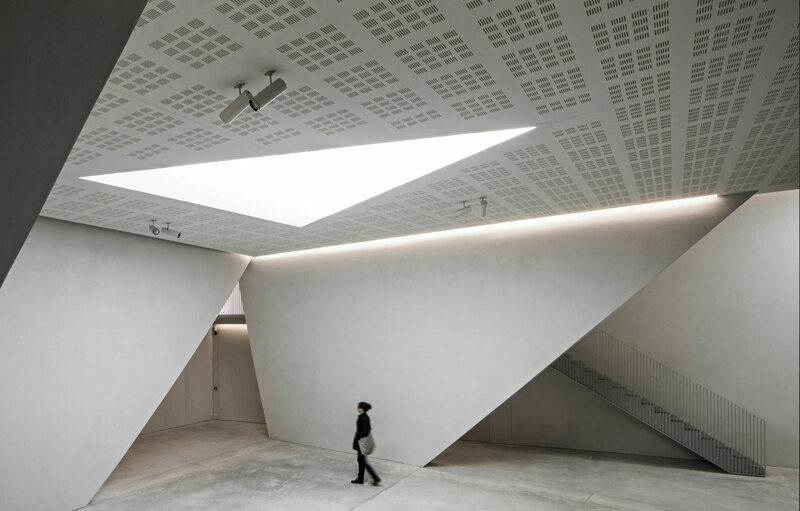 Japanese architect Tadao Ando has added an auditorium with a curving concrete interior to the Palazzo Grassi – a contemporary arts centre inside an eighteenth-century palace in Venice. 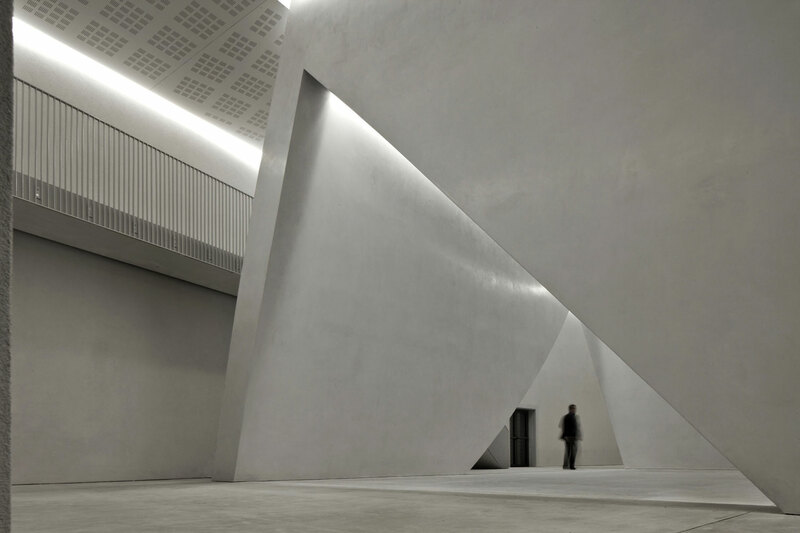 Curving concrete walls separate the auditorium from reception areas, dressing rooms and storage areas, providing a blank canvas for artwork and film projection. Light fixtures are tucked around the edges of a suspended ceiling in the main lobby, while triangular skylights offer a source of daylight. VALLEACERÓN CHAPEL BY SANCHO-MADRIDEJOS ARCHITECTURE OFFICE // ALMADÉN, SPAIN. Image courtesy of . Photo by . 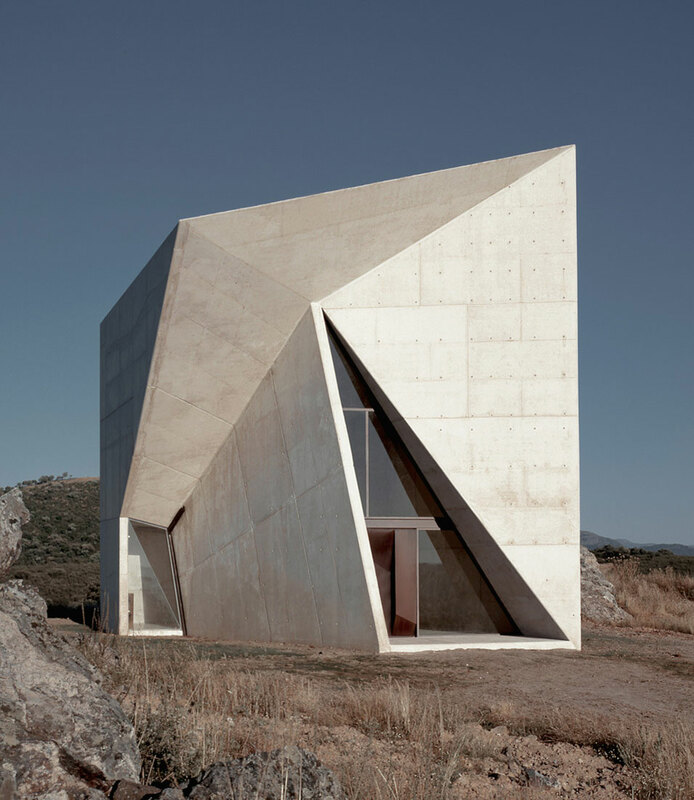 Designed by Madrid-based architecs S-M.A.O., the Chapel in Valleacerón is a folded concrete structure developed around the study and manipulation of a focally tensed box-fold. The chapel is set at the top of a small hill, making it a part of the landscape seen from the property entrance. CONRAD BALI RESORT & SPA INFINITY POOL // BALI, INDONESIA. 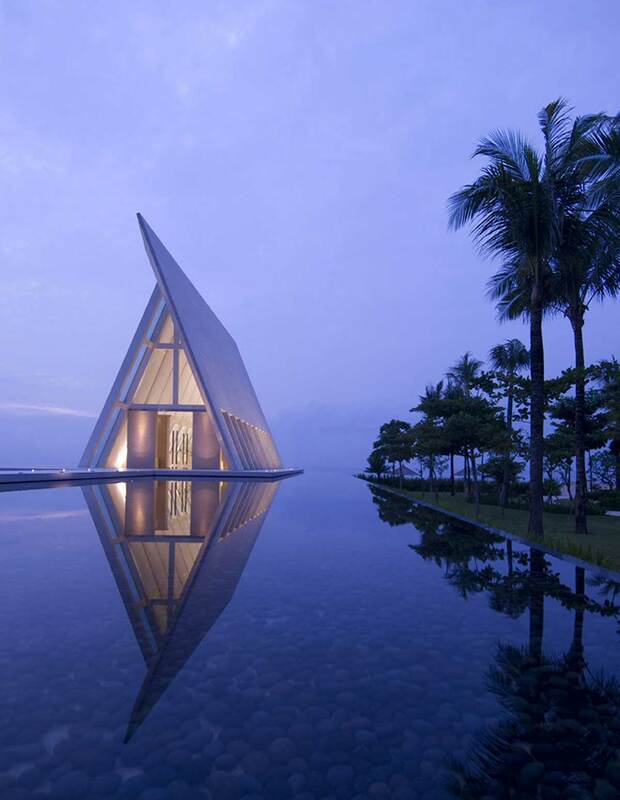 The Conrad Bali Resort offers a selection of intimate indoor and outdoor locations for weddings, known as the Infinity Chapel – a magnificent purpose built glass triangular structure. 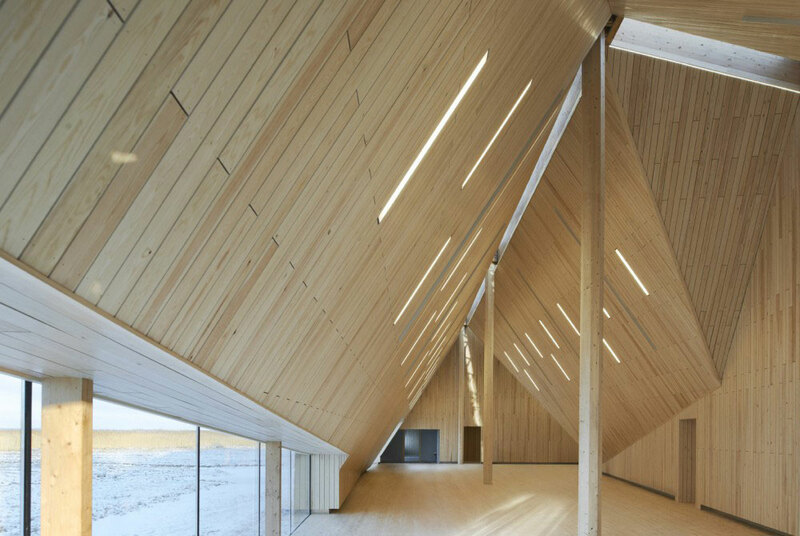 VELJLSKOVGAARD STABLE BY LUMO ARCHITECTS // ODDER, DENMARK. The Vejlskovgaard Stable in Odder, Denmark sheds our preconceptions of farm design with their 8,800 sqm stable. Danish building fund Realdania and a family owned farm came together to modernise the structure of the traditional farm by designing the stable based on the landscape of the surrounding hilly environment. “It has been of major importance to fit the shape and the architecture of the stable with the landscape so the qualities of the hills and the surrounding not is lost but is enhanced and respected.” – LUMO Architects. 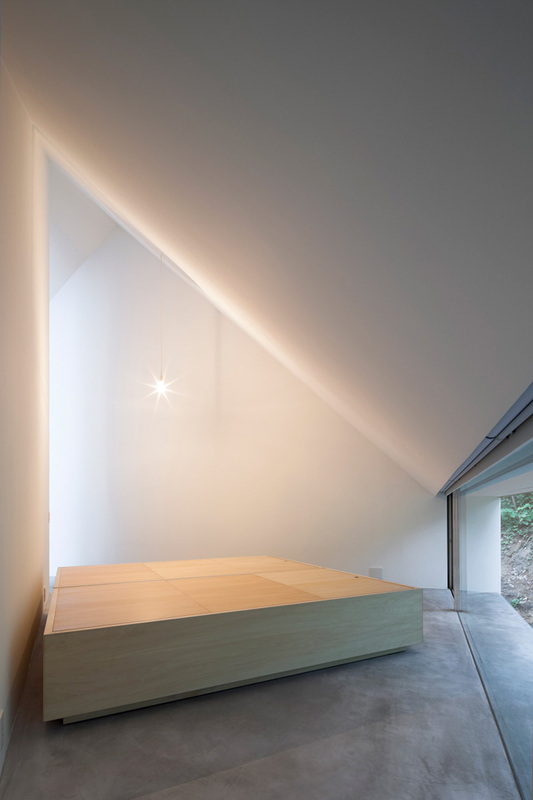 A HILL ON A HOUSE BY YUKO NAGAYAMA & ASSOCIATES // TOKYO, JAPAN. “This is an urban house surrounded by tall buildings on all sides except for the northeast facing a street. The issue was how to bring light into the interior, to open the enclosed volume and to develop scenery within it while avoiding looks from the neighbourhood. 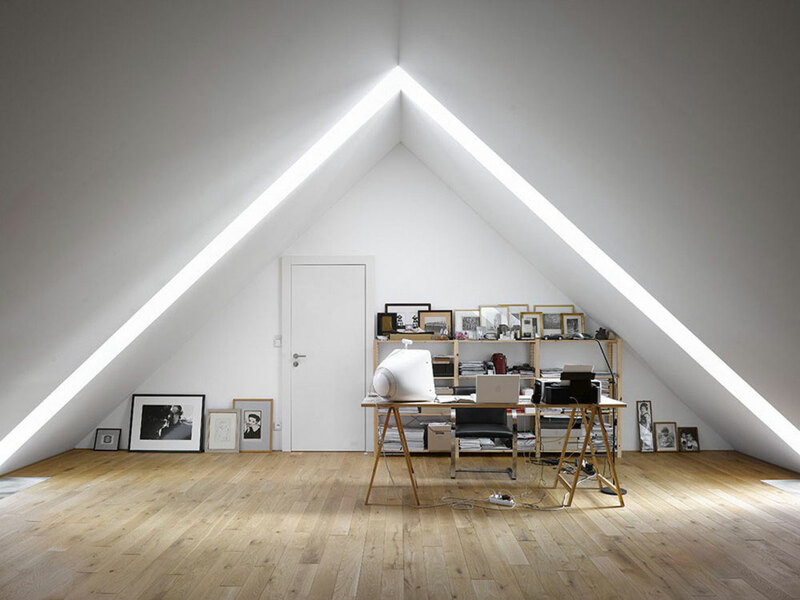 There rises a white illuminated “hill” in the house.” – From the Architects. 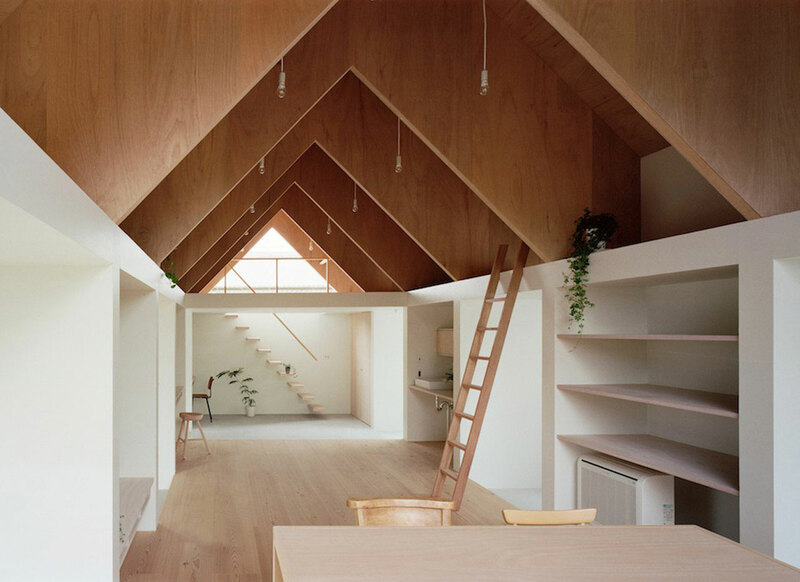 House Built Over a Pastry Shop by Yuko Nagayama & Associates // Chiba, Japan. 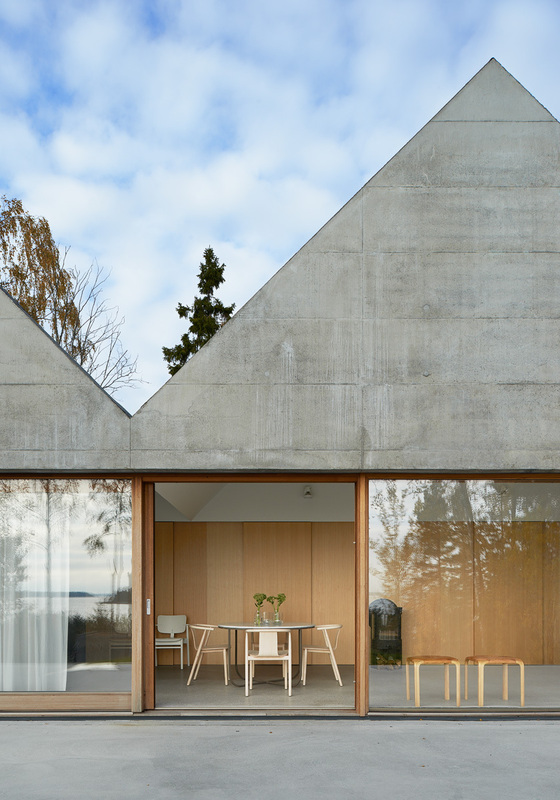 A row of raw concrete gables give a zig-zagging profile to this summer house by Swedish studio Tham & Videgård Arkitekter on an island in the Stockholm archipelago. Oriented towards the bay, the wide and shallow house was designed by Tham & Videgård Arkitekter to stretch across its site like a line of boathouses, creating five pitched rooftops with varying proportions. Previously featured // Summerhouse Lagnö by Tham & Videgård Arkitekter // SWEDEN. 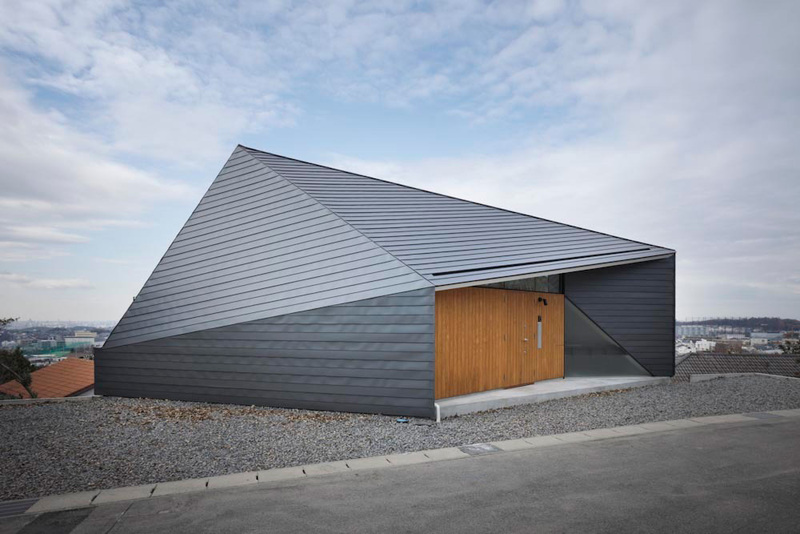 GROUP HOME BY SOU FUJIMOT // HOKKAIDO, JAPAN. The frame of the space in this share home for elderly people with dementia is made from the grid swinging gently perpendicularly. Sou Fujimoto’s approach is an optimistic one, where he sees architecture’s role as to “continuously re-imagine enriching places for people”. While his works appear highly minimalistic and abstracted on the surface, they seek to create spatial experiences that prompt various degrees of human interactions and also restore the primitive relationship between people and nature. BUDAPEST MUSIC CENTRE BY ART1ST DESIGN STUDIO // BUDAPEST, HUNGARY. Image courtesy of . Photo by Tamás Bujonovszky. This building was originally a residential building constructed in 1890. During the Second World War it became the Russian military quarters. 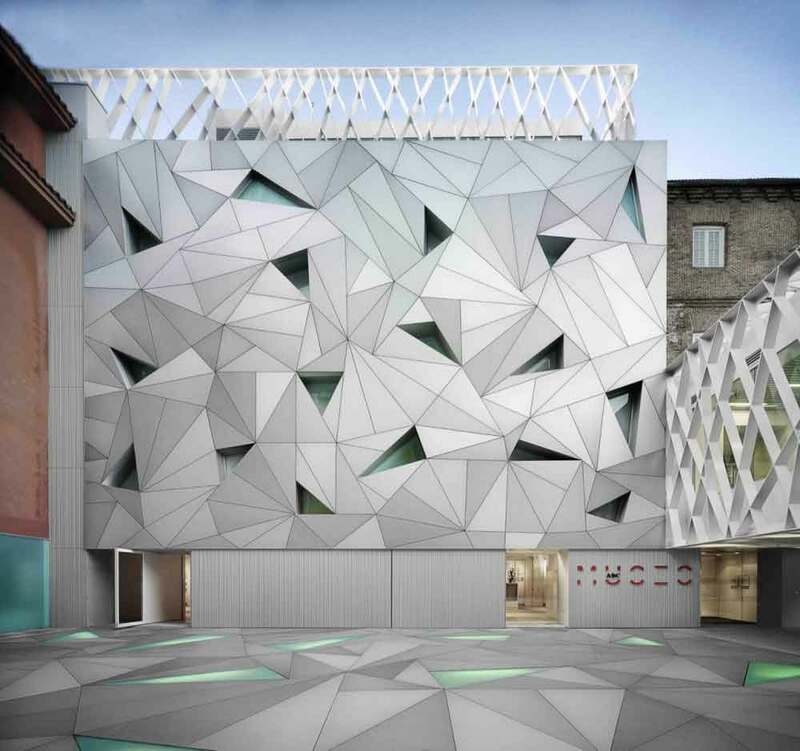 ABC MUSEUM, ILLUSTRATION AND DESIGN CENTER BY ARANGUREN & GALLEGOS ARCHITECTS // MADRID, SPAIN. The ABC Centre of Drawing and Illustration in Madrid is a re-adaptation of an the old factory building. The new iteration of the building doesn’t sacrifice the original character, at the same time creating a contemporary centre with a diverse range of cultural and artistic institutions. Previously featured // ABC Museum, Illustration and Design Centre | Madrid, Spain. FAMILY HOUSE BY STUDIO PHA // KLOKOČNÁ, PRAGUE. 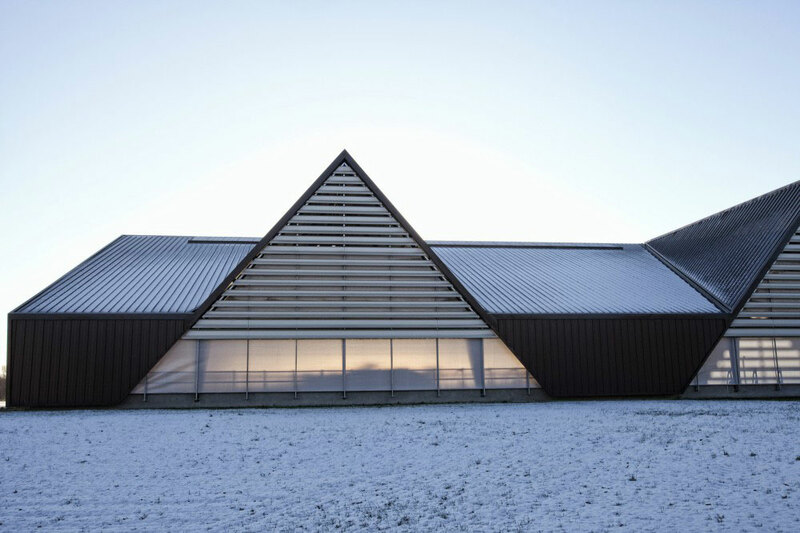 The inspiration for the basic shape of this building was an economic type of historic building – the barn, which offers some proportion in the transition to a contemporary aesthetic. 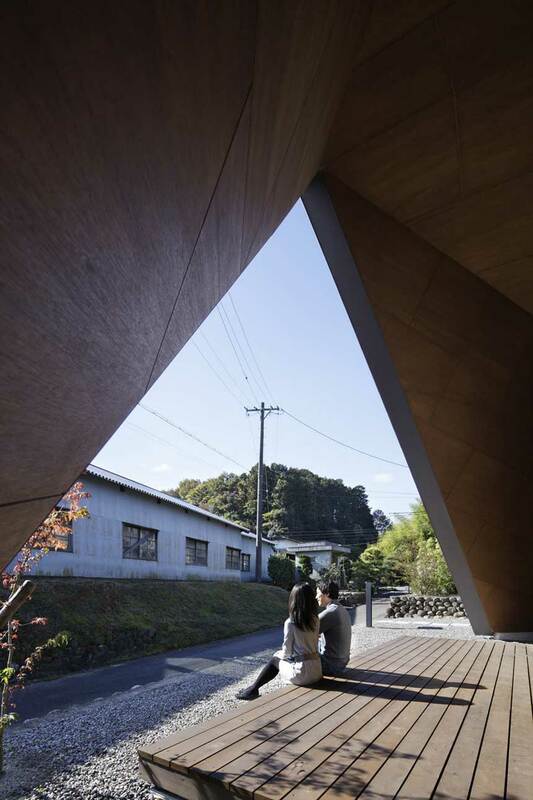 HOME-FOR-ALL BY ZHAOYANG ARCHITECTS // KESENNUMA, JAPAN. The home-for-all in Kesennuma is designed and built as a gathering space for a fishing community that severely suffered from the Tsunami in 2011. It’s a shelter in which fishermen can take a rest, a place where the wives would wait for their husbands to return. 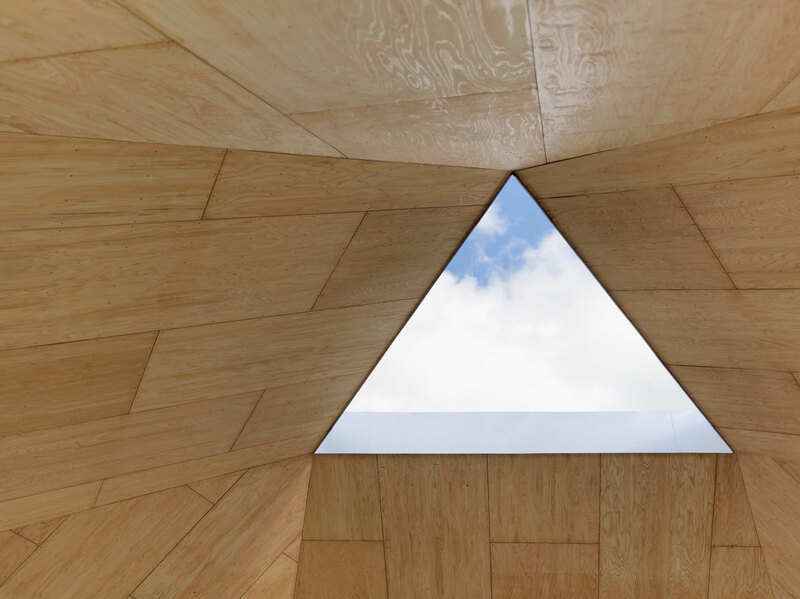 At the centre is a triangular-shaped hole in the ceiling that allows people to gaze directly at the sky. HOUSE KN BY KOCHI ARCHITECTS STUDIO // KANAGAWA, JAPAN. Image courtesy of . Photo by Nobumitsu Watanabe. Employing a big box approach to house design, House KN by Kochi Architect’s Studio, began with a rectangular volume, which was then opened up with strategic voids, to bring in the suburban landscape and create a feeling of larger scale. 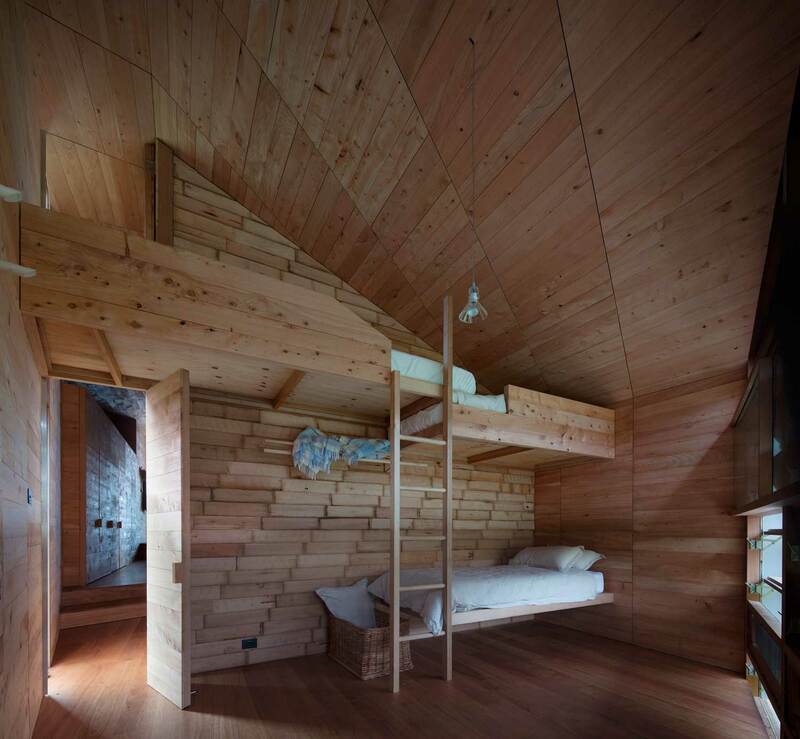 KOYA NO SUMIKA BY MA-STYLE ARCHITECTS // SHIZOUKA, JAPAN. Images courtesy of mA-style Architects. Photography by Kai Nakamura. 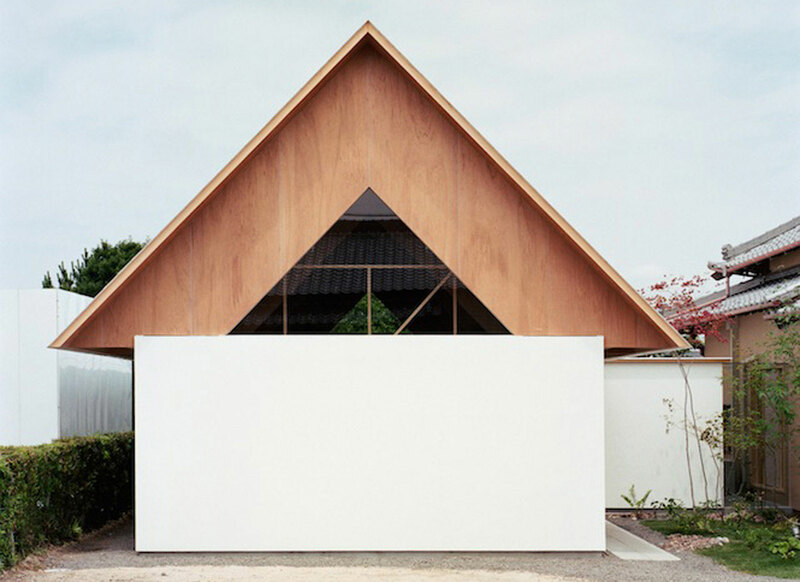 Tokyo-based mA-style Architects have expanded a typical rural Japanese residence to create a separate home for a young couple. ‘Koya No Sumika’ provides a retreat space for the clients for sleeping and quiet time, while the kitchen, bathroom, main living space and children’s bedrooms remain shared with the main house. See the rest of this project in this Gallery Post. 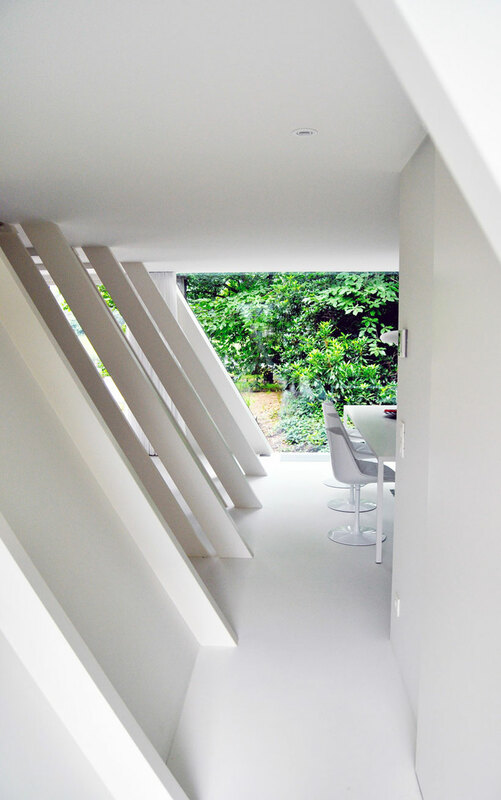 EXTENSION VB4 BY DMVA // BRECHT, BELGIUM. Images courtesy of . Photography by Mick Couwenbergh. 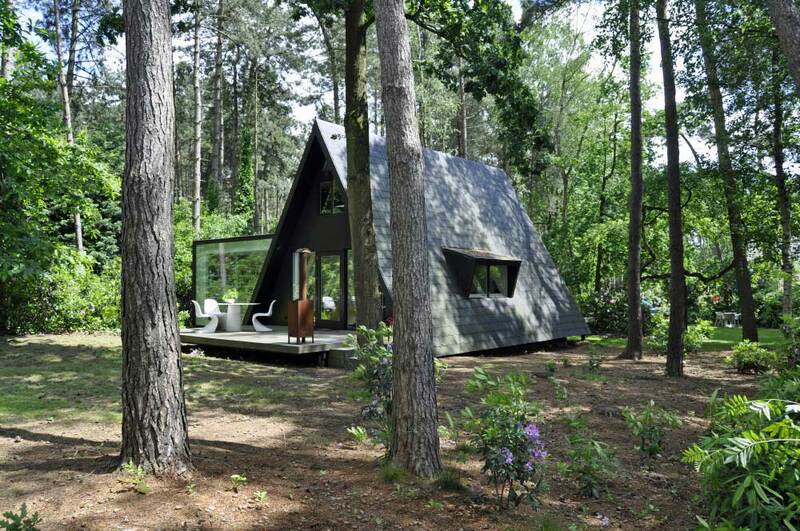 Situated a former recreation area, dmvA designed an organic shaped house that winded between the fir-trees. Although nature was highly respected, this design did not meet the demands of building authorities and was therefore rejected. This led to the design and construction of the well-known, mobile BlobvB3. 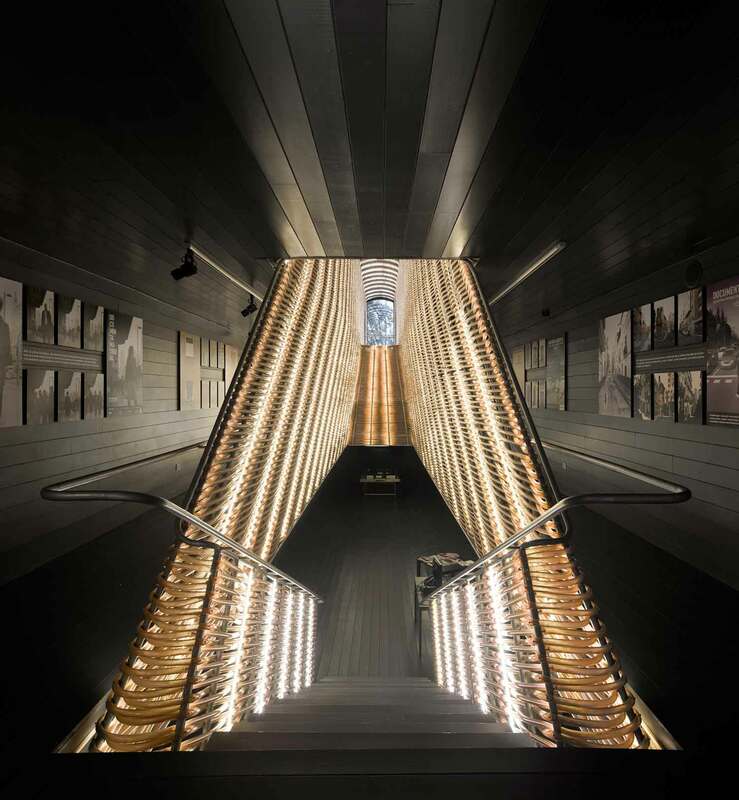 The search for a design which was strong enough to touch the pyramid form, resulted in a floating volume – a ‘tunnel’ built with trapezoidal wooden constructions. ALLANDALE HOUSE BY WILLIAM O’BRIEN JR // MOUNTAIN WEST, USA. Images © . Rendering by . 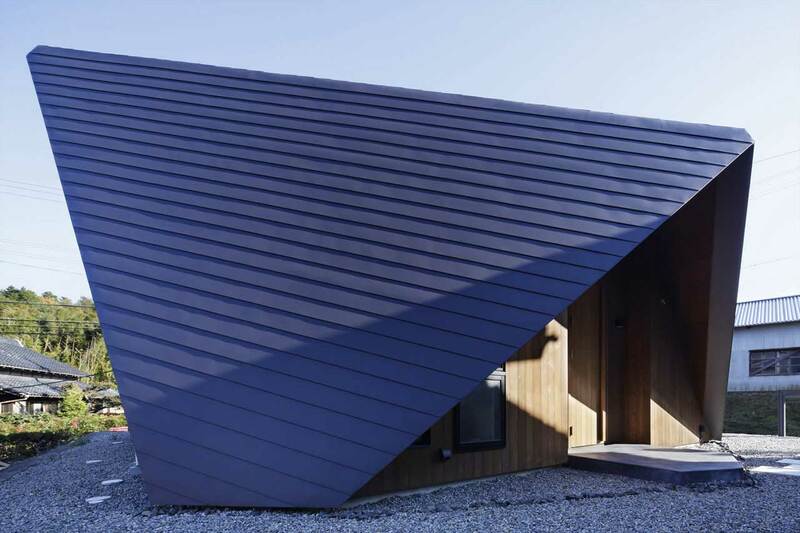 Allandale House is an A-frame(s) house for an idiosyncratic connoisseur and her family. The house aims to undermine the seeming limitations of a triangular section by augmenting and revealing the extreme proportion in the vertical direction. Previously featured // Allandale House by William O’Brien. PARAMOUNT ALMA BY PLASMA STUDIO // SESTO, ITALY. Image courtesy of . Photo by Hertha Hurnaus. 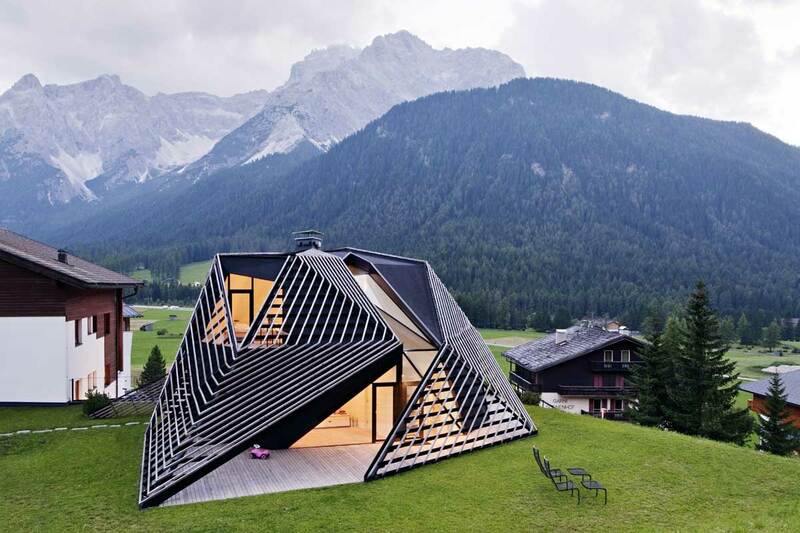 Located in Sesto, Italy, the Paramount – Alma Residence was designed by the Plasma Studio as a new home for the architect Ulla Hell and her family. 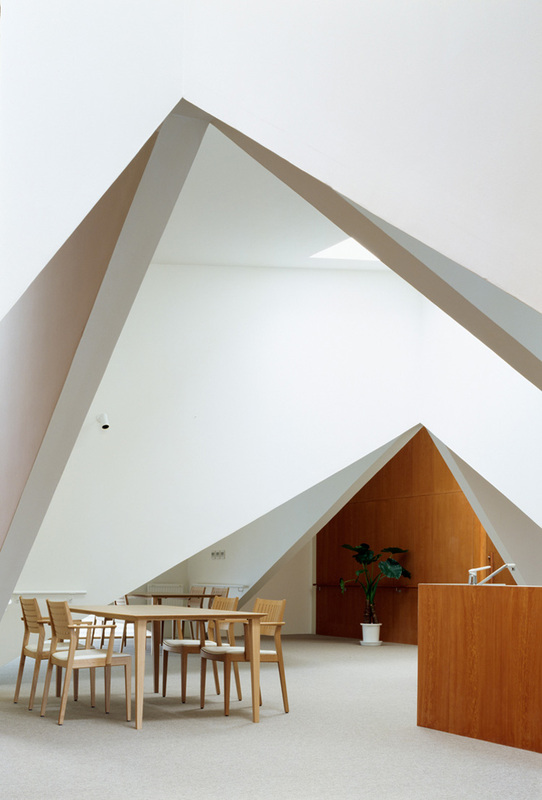 A new angular crown roof structure encloses the existing building from the 1960s. PERATHONER BY BERGMEISTER WOLF ARCHITEKTEN // PONTIVE, ITALY. 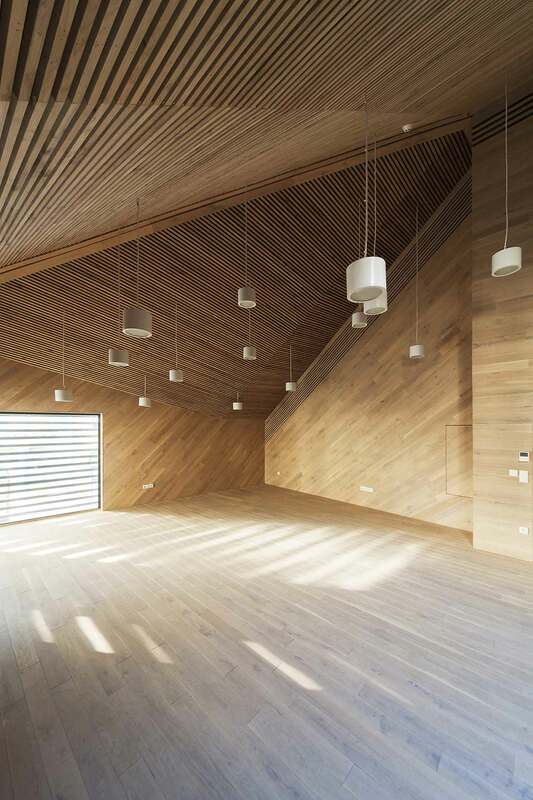 The headquarters of timber sculpture company Perathoner, was built in Pontives by Bergmeister Wolf Architekten. The façade on this estate consists of a self-supporting folding system made of triangles – inspired by the wood carving tools and skills of the local artisans. ASSEMBLE OFFICE // MELBOURNE, AUSTRALIA. 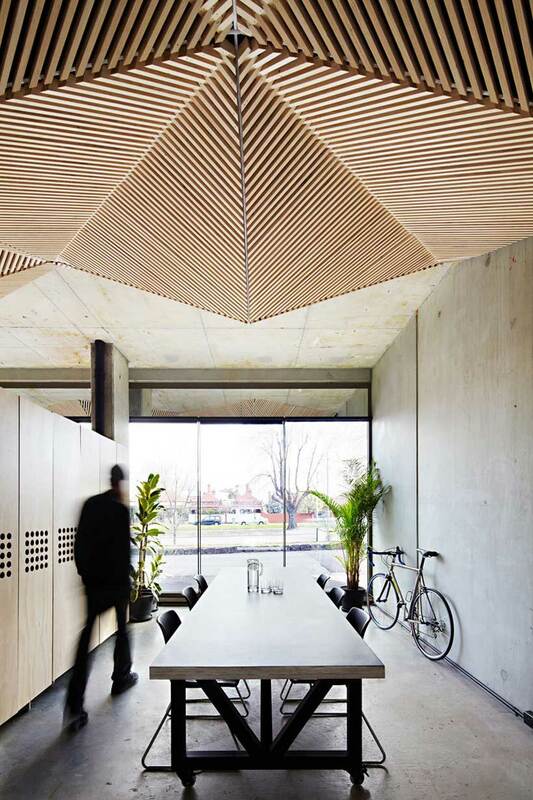 The existing office of Melbourne-based Assemble studio was largely open and made of concrete, leading to terrible acoustics and ample echoing. To combat this issue Assemble’s designers created their own riveted installation; it covers pipes, ductwork, smoke detectors, fire alarms, an air conditioning system and a labyrinth of “other ugly services” beneath it. 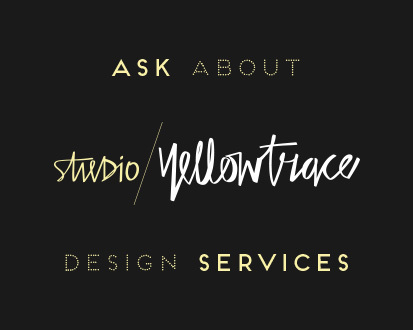 See the rest of this project in our Gallery Post. 48 NORTH CANAL ROAD BY WOHA // SINGAPORE. This boutique office is a reconstruction of a pair of heritage-listed shophouses, designed by WOHA in Singapore. 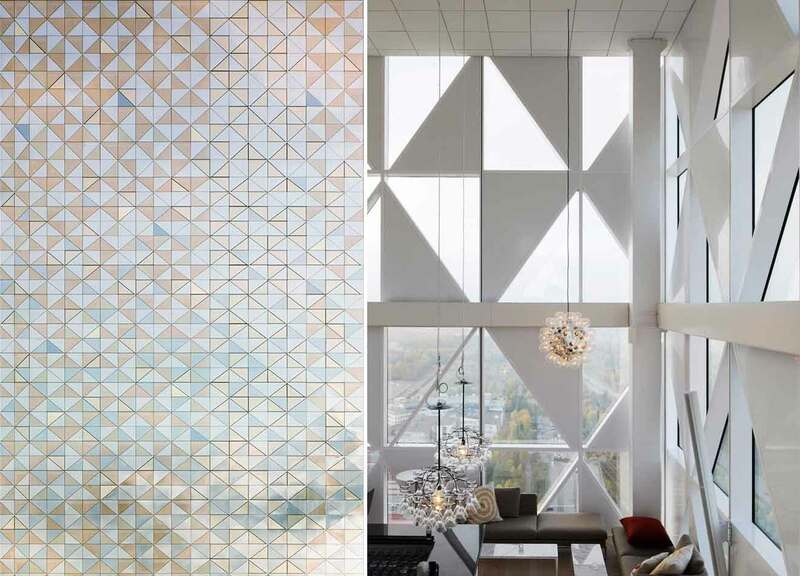 The architectural language of fractal, triangulated geometry originated from the need to comply with authority requirements of having splayed corners as the building is bounded by three roads. This was carried through in the form of internal angled walls and external slanted planes, revealing a concave curtain wall. 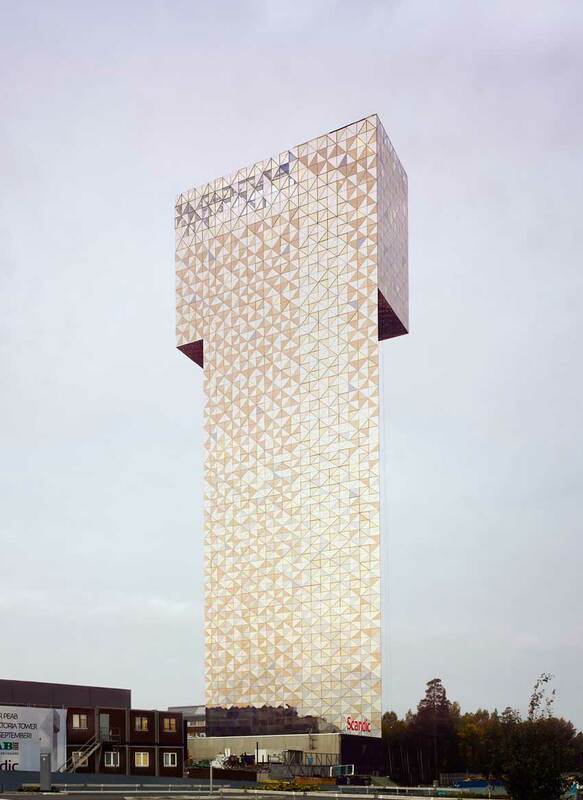 VICTORIA TOWER BY WINGÅRDH ARKITEKTKONTOR AB // STOCKHOLM, SWEDN. Images courtesy of . Photography © . 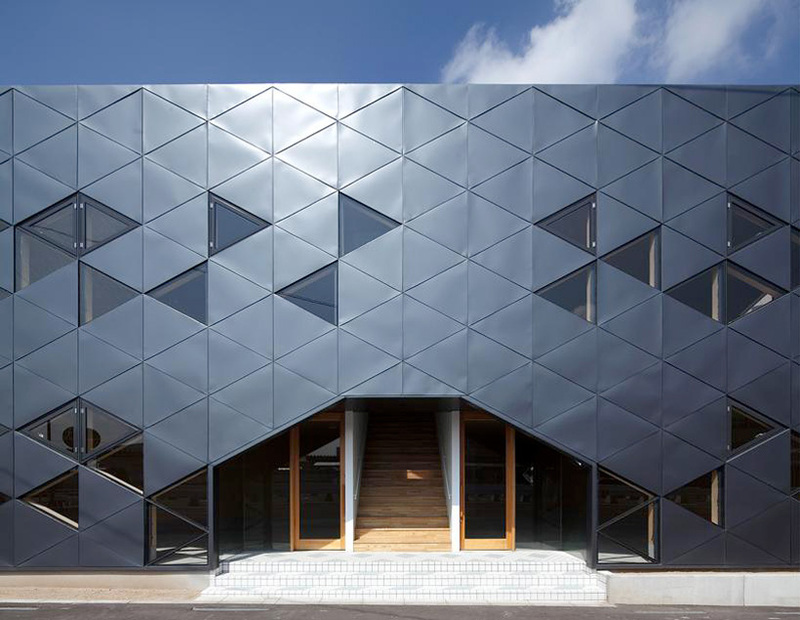 DABURA COMMERCIAL BUILDING FULL OF TRIANGLES // JAPAN. Japanese firm, Design for Architectural Biological Urbanization Research Associates (DABURA) play with triangle patterns in the floor-plan plan and elevations at Sankakudzukushi, a commercial building in Japan. DANISH MARITIME MUSEUM BY BJARKE INGELS // HELSINGOR, DENMARK. Built within the crevasse of a dry dock in the historic surrounds of Helsingor’s Kronborg Castle, Bjarke Ingels completed the Danish Maritime Museum – visible only as an imprint of a ship. By looping the museum around the dock’s 60-year-old walls, Ingles was able to preserve the heritage structure while transforming it into a courtyard that provides daylight deep into the heart of the museum. DRAGON SKIN PAVILION BY EMMI KESKISARJA, PEKKA TYNKKYNEN & LEAD // KOWLOON PARK, HONG KONG. Image courtesy of . Photo by & Emmi Keskisarja. 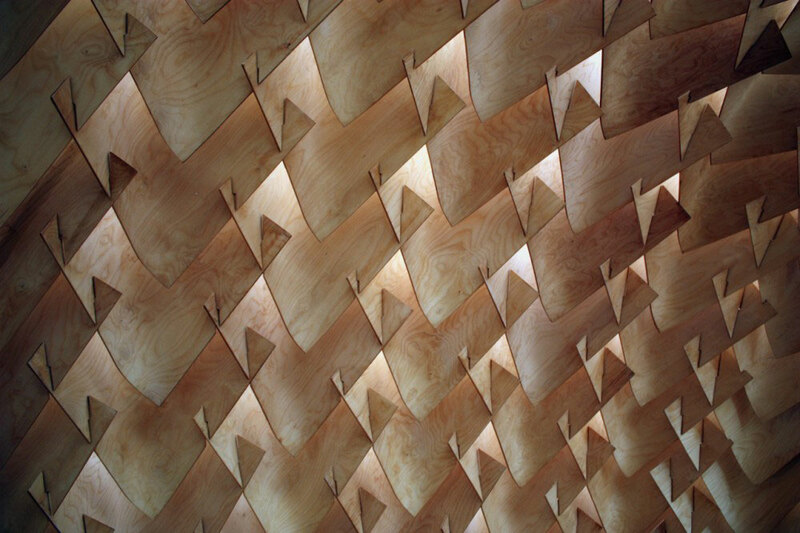 The Dragon Skin Pavilion is an architectural art installation that challenges and explores the spatial, tactile, and material possibilities architecture, offered today by revolutions in digital fabrication and manufacturing technology. FACTS TÅKERN VISITOR CENTRE BY WINGÅRDH ARKITEKTKONTOR AB // GLÄNÅS, SWEDEN. Image courtesy of . Photo © . All the way out where the forest ends and the reeds begin, a visitor centre hovers low on piles set carefully into the water’s edge. 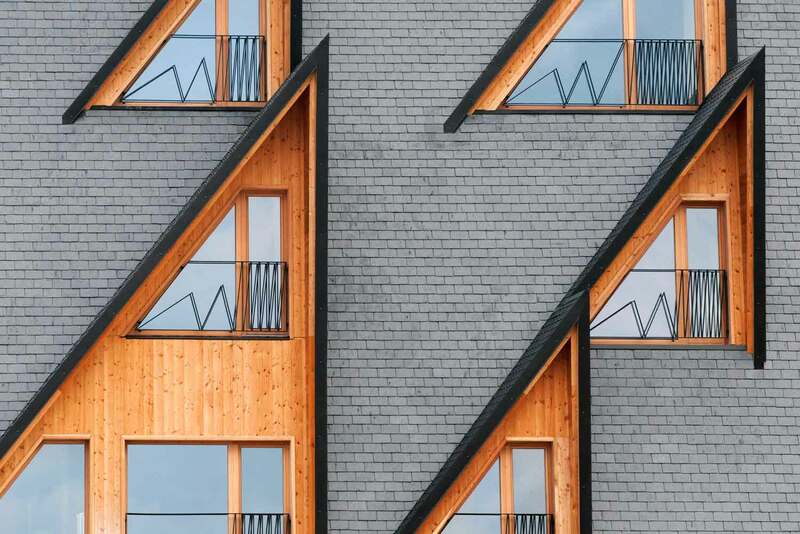 The centre uses traditional local materials to break new ground with its crystalline geometry with steep roofs that transition seamlessly into walls. The ridge, where a thatched roof is most vulnerable, is transformed into a glazed skylight. 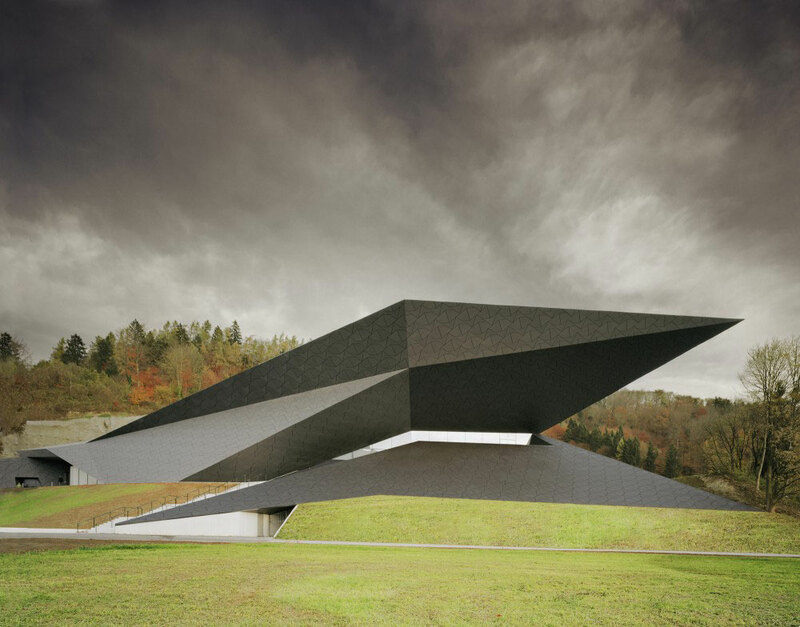 FESTIVAL HALL IN ERL BY DELUGAN MEISSL ASSOCIATED ARCHITECTS // MÜHLGRABEN, AUSTRIA. The geometry of the Festival Hall developed from the topographical conditions, placing it in an adequate relationship with the existing Passionsspielhaus. The building’s form and positioning both relate to the impressive landscape setting, defined by the rock formations in the back, and to the dynamic presence of its neighbouring historical counterpart. FOREST BATH BY KYOKO IKUTA & KATSUYUKI OZEKI // NAGANO, JAPAN. Image courtesy of . Photo by Tomohiro Sakashita. Kyoko Ikuta Architecture Laboratory and Ozeki Architects & Associates have designed this single-storey summer home in Nagano, Japan. 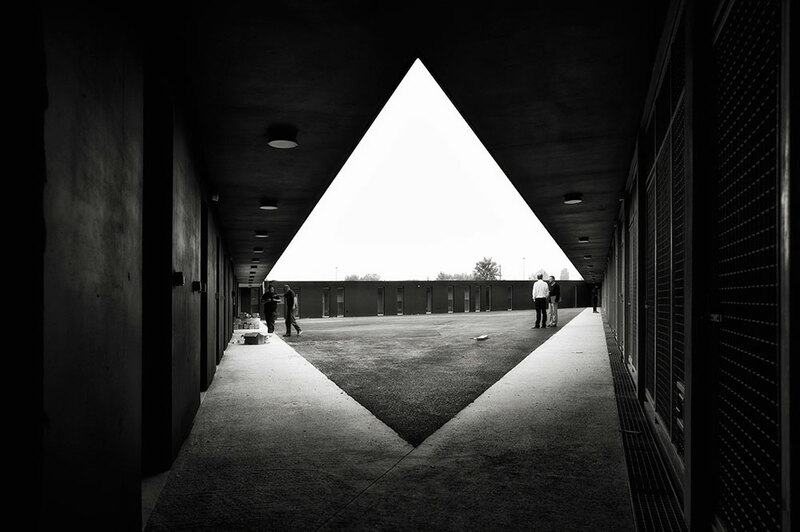 Situated on a flat site which does not have the vantage point for sweeping views, the design carves out a triangular plane into the structure’s form to extend the eyes obliquely up towards the sky. The dramatic angles of the roof is highlighted with a triangular void that lends a level of transparency to the solid exterior. 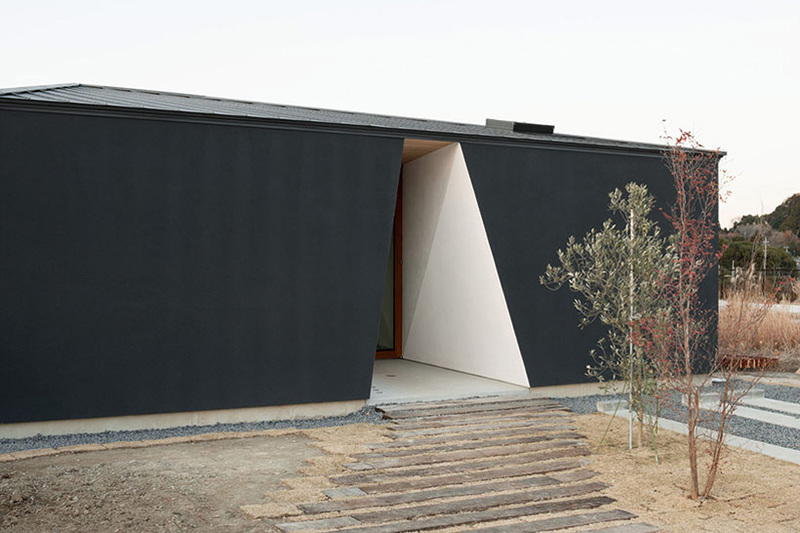 KIRITOSHI HOUSE BY DAISUKE SUGAWARA // CHIBA PREFECTURE, JAPAN. 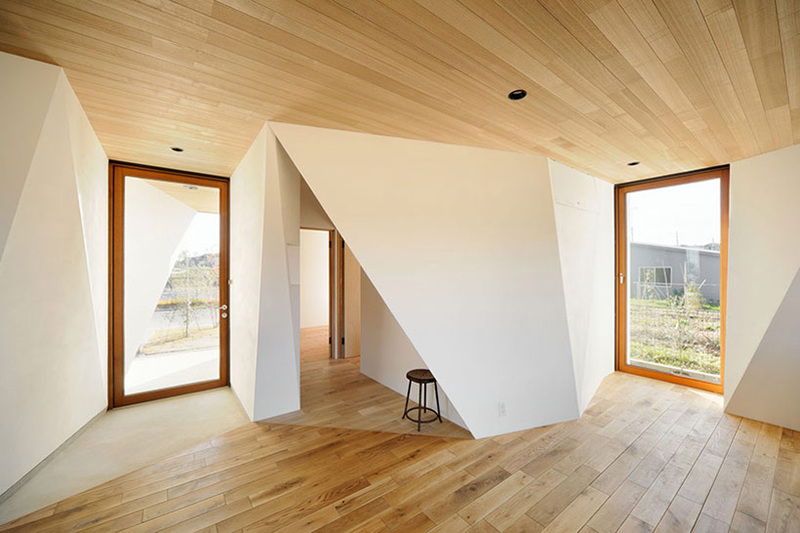 ‘Kiritoushi’ is a single family residence located on the threshold between an older suburban development and rural fields, designed by Japanese architect Daisuke Sugawara. The outer form helps the timber structure to fit within its suburban context, a concept that is broken immediately upon entering the home. 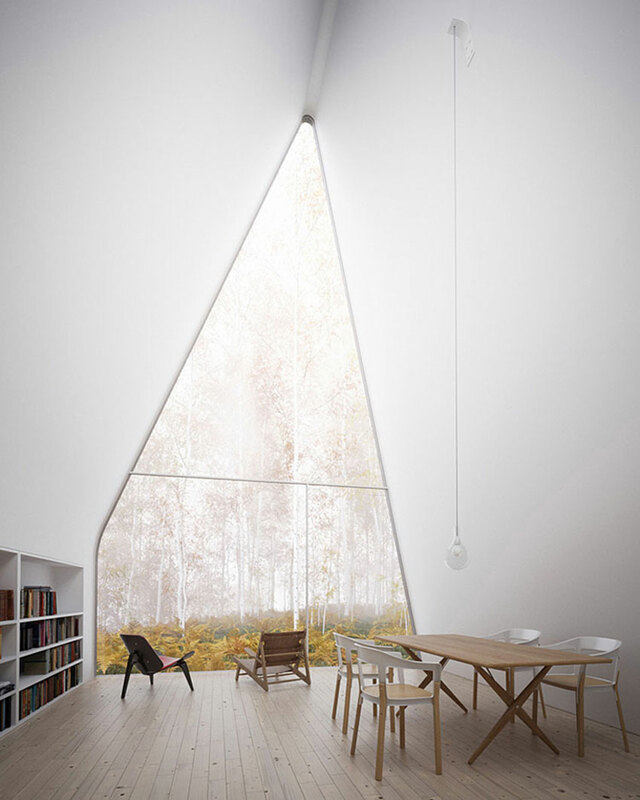 Angular cuts carve a large central social space surrounded by more private space. 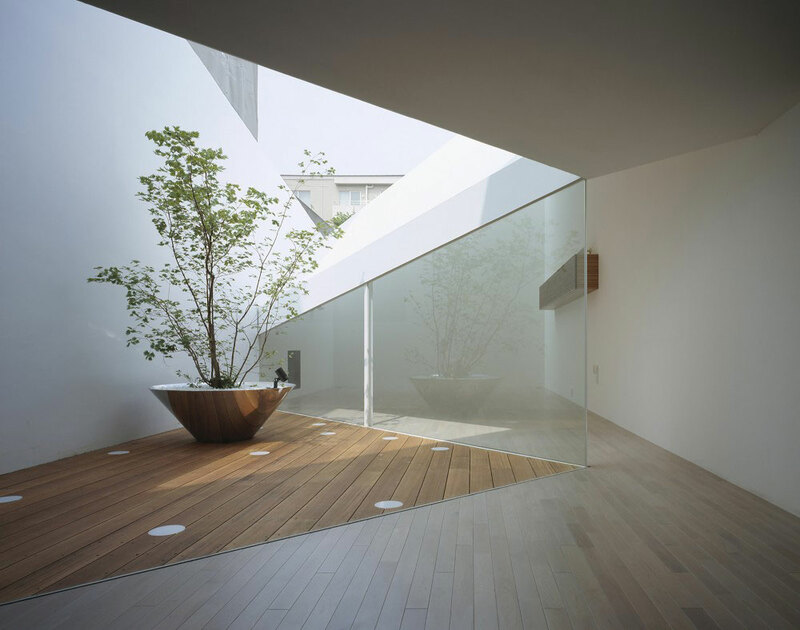 K HOUSE BY D.I.G ARCHITECTS & NAWAKENJI-M // NAGOYA, JAPAN. Images courtesy of . Photo by Tomohiro Sakashita. This small faceted house by Japanese studios D.I.G Architects and Nawakenji-m is embedded in a steep slope overlooking the city of Nagoya. “Not a house constructed on a cliff, but a habitat generated by the nature form of the cliff. 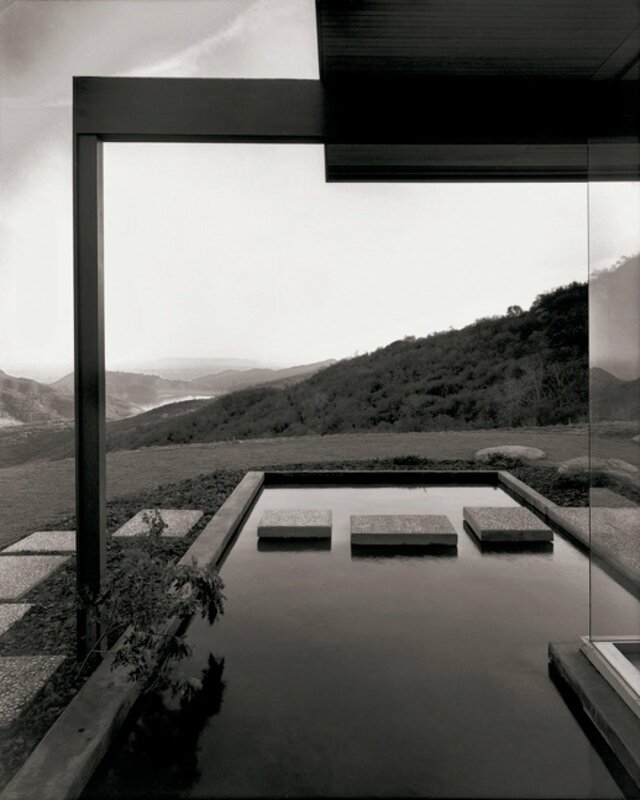 A habitat like a pit or a shed later discovered in the terrains of landscape.” The architects excavated into the hill to level the site and created a large living room on the sunken floor. SLOW HORSE HOTEL BY ELASTICOSPA // PIANCAVALLO, ITALY. In the small ski-resort town of Piancavallo, the ‘Slow Horse’ hotel injects a sobering architectural gem contrasting an array of lavish structures. In a setting where the public comes to play with the snow, the building itself plays with the accumulation or dispersion of snow, incorporating ice stalactites into the winter aesthetic. Designed by Italian practice Elasticospa, the building is the result of a partial reconstruction of an existing building. 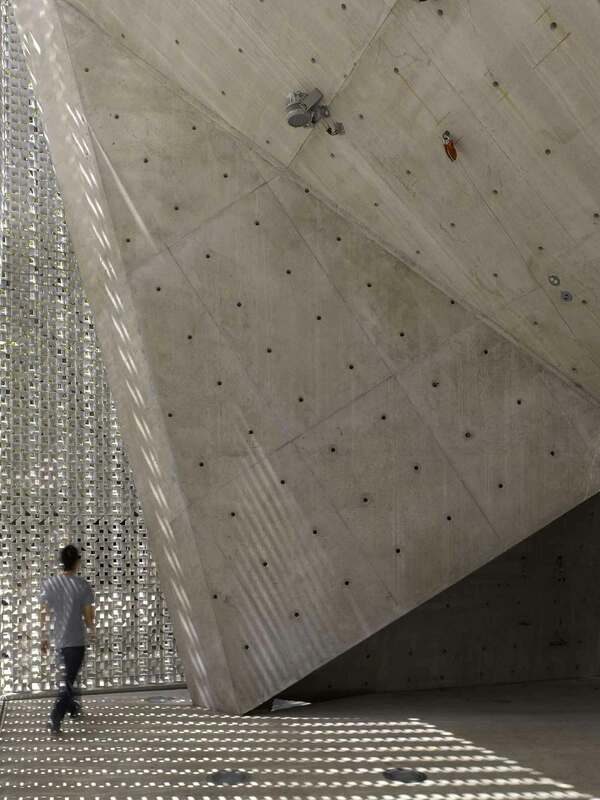 ROCK CLIMBING GYM BY NEW WAVE ARCHITECTURE // POLUR, IRAN. 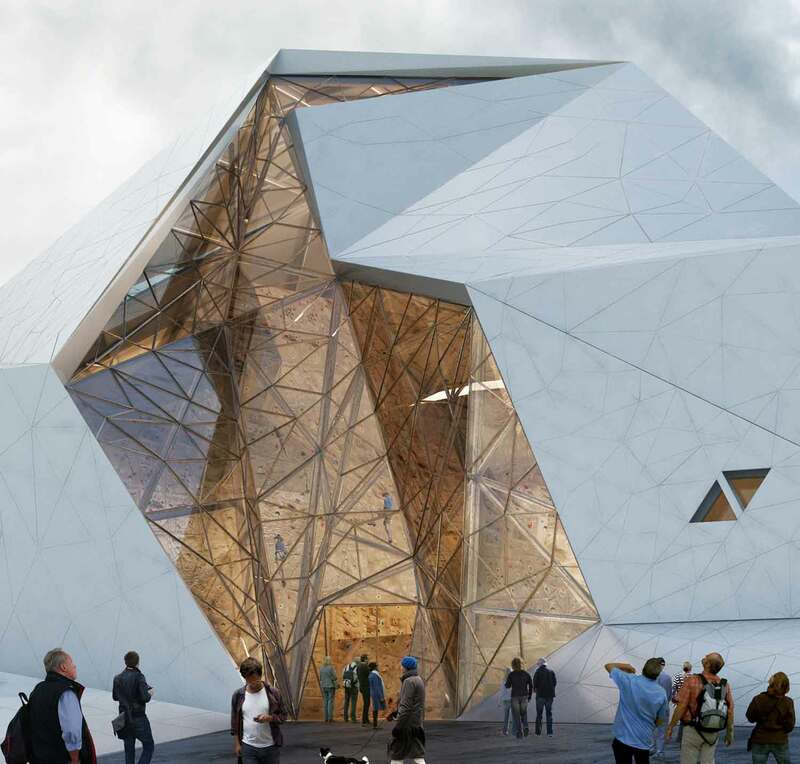 In response to the climbing potential of Polur, Iran, New Wave Architecture has designed a new rock climbing hall within the rocky lands of Mazandaran. Overlooking the country’s highest peak, the “fragmented mass” invites nature and landscape to “visually creep into the building”, offering daylight and establishing a strong connection between climbers and the surrounding landscape. (In case you couldn’t tell – this image is a rendering). CHONGQING MOUNTAIN + CITY SALES OFFICE BY ONE PLUS PARTNERSHIP // CHONGQING, CHINA. 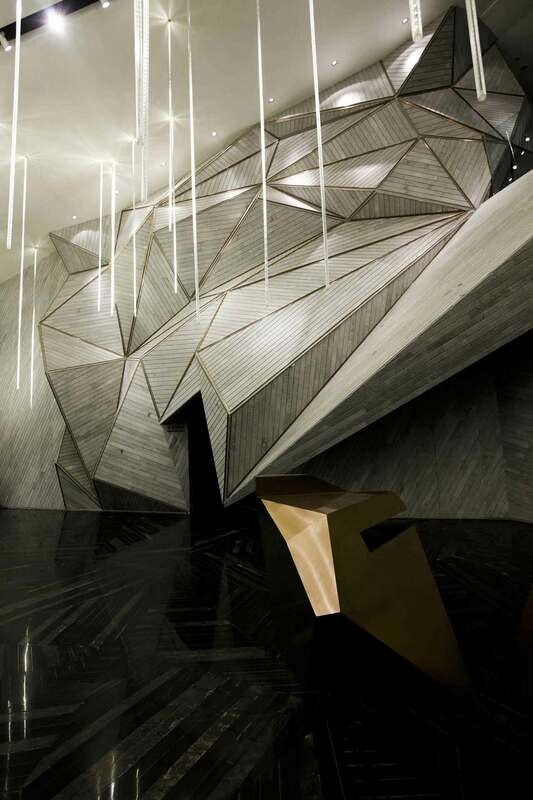 Designed by Plus Partnership, this interior represents the valley and mountain landscape of the surrounding Nanshan district, creating a parallel geological and craggy setting. 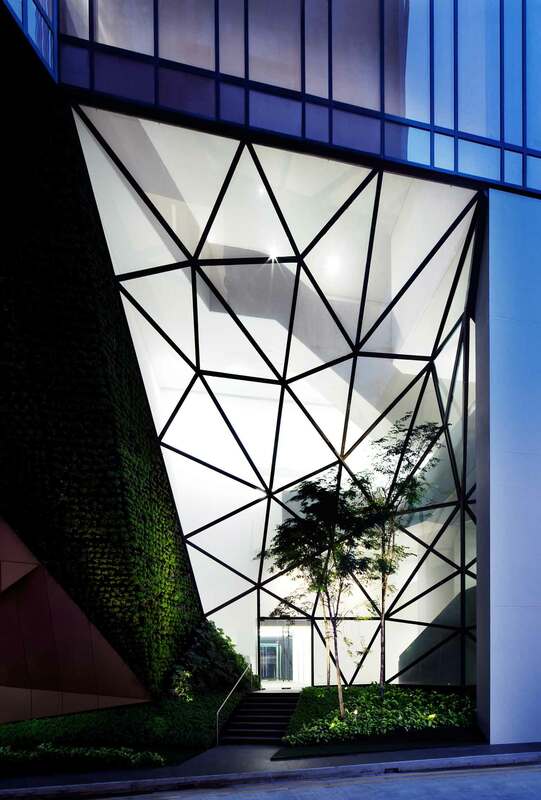 Slanted and triangulated masses form the partitions, producing a small-scale mountain-scape inside. A triangulated marble floor pattern continues the theme generating an appearance of uneven terrain underfoot. KENNEL FOR POLICE UNIT BU FASSIO-VIAUD ARCHITECTS & DAVID DEVAUX // MOISSY-CRAMAYEL, FRANCE. This Kennel is located in an unlikely triangular site lost between railway, high voltage lines, factories and local roads. 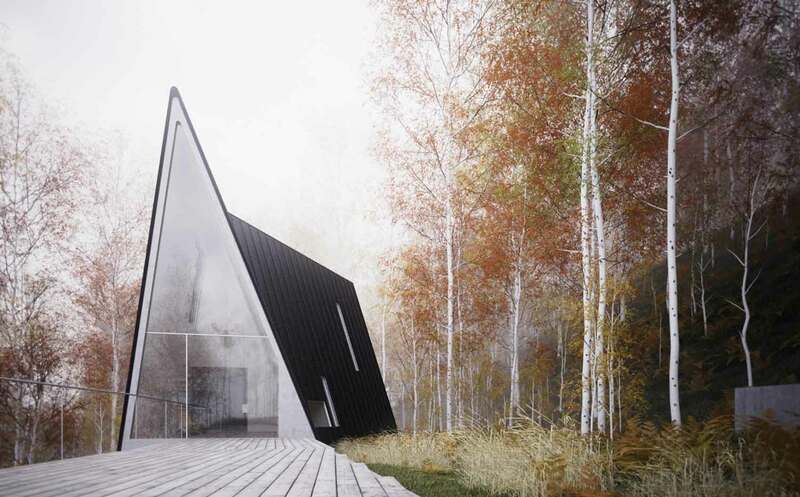 The simple black, almost brutal, minimalist treatment was decided with users as the most appropriate architecture with the purpose of the building. MATADERO THEATRE AND FILM LIBRARY BY CH+QS ARQUITECTOS // MADRID, SPAIN. Image courtesy of . Photo by by . 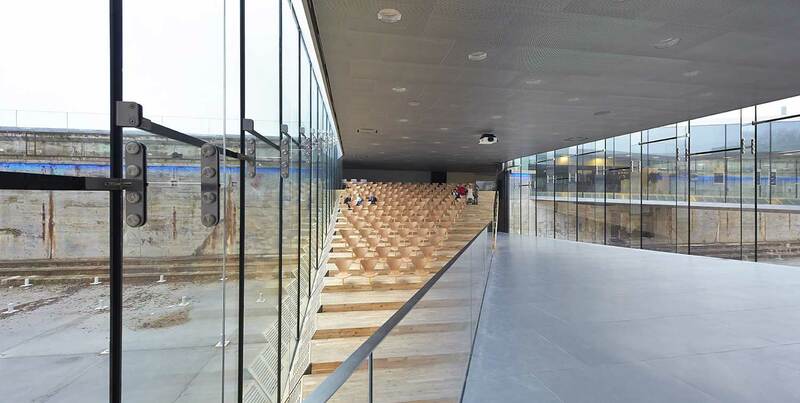 Designed by the talented folks at CH+QS Architects, this library, film set and two movie theatres represent the new space dedicated to the world of non-fiction cinema at the Matadero cultural complex. Previously featured // Matadero Theatre and Film Library by CH+QS Arquitectos | Madrid, Spain. Related post // Hub Offices in Madrid | CH+QS Arquitectos. 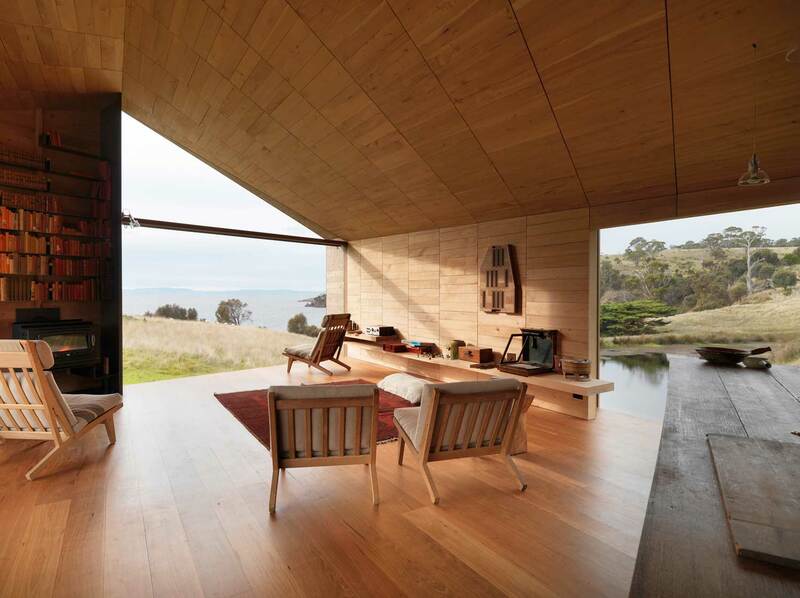 SHEARERS QUARTERS HOUSE BY JOHN WARDLE ARCHITECTS // TASMANIA, AUSTRALIA. This charming shearers quarters sits as a companion building to an existing historic cottage on a working sheep farm. The plan form transforms along its length to shift the profile of a slender skillion at the western end to a broad gable at the east. 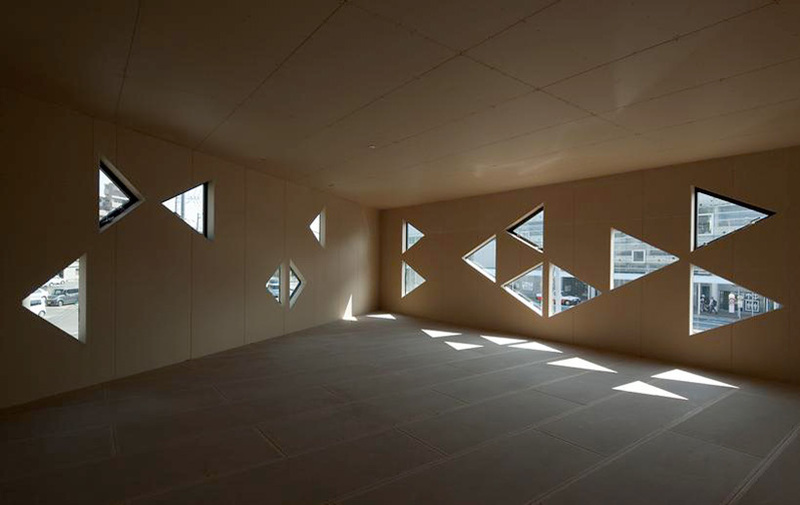 The geometry of this shift is carried through to the layout of internal walls, lining boards and window frames. 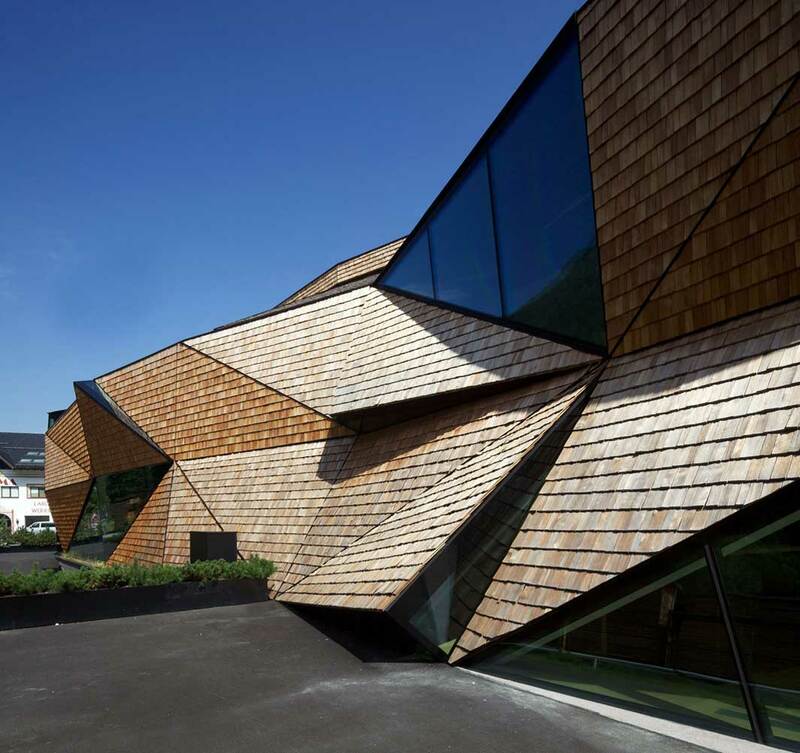 CULTURAL CENTER IN MULHOUSE BY PAUL LE QUERNEC // MULHOUSE, FRANCE. 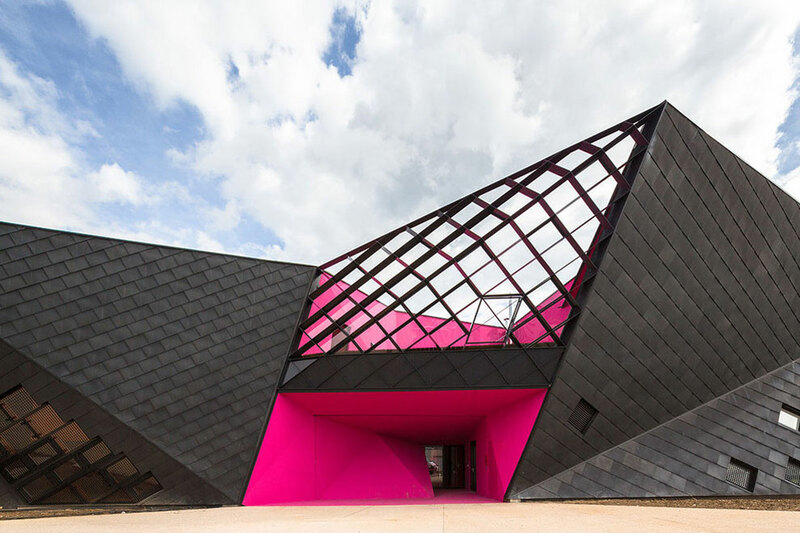 French architect, Paul Le Quernec has employed triangular geometries in the building’s form that have resulted in a faceted volume whose angled lines offer a dynamic structure within this traditional small town. TAMAKICHI MOCHITEN BY NAKAHIRA ARCHITECTS // TSU, JAPAN. 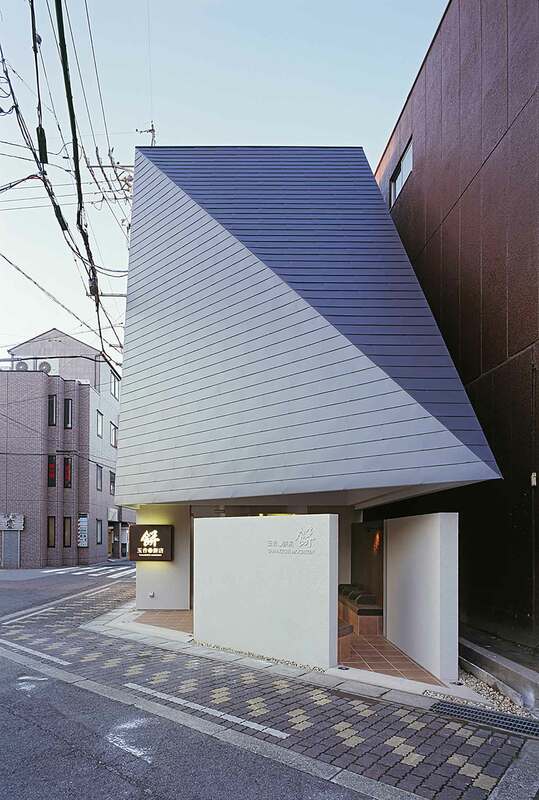 Tamakichi Mochiten is a rice-cake shop designed by Osaka-based practice Nakahira Architects. The main design requests from this client were to combine Japanese tradition with modern, and to stand with presence along the intersection. HAUS AM MOOR BY BERNARDO BADER ARCHITECTS // VORARLBERG, AUSTRIA. Image courtesy of . Photo by Adolf Bereuter. Bernardo Bader Architects used locally sourced spruce, fir and elm to clad the interior and exterior of this rural cabin in Vorarlberg – Austria. 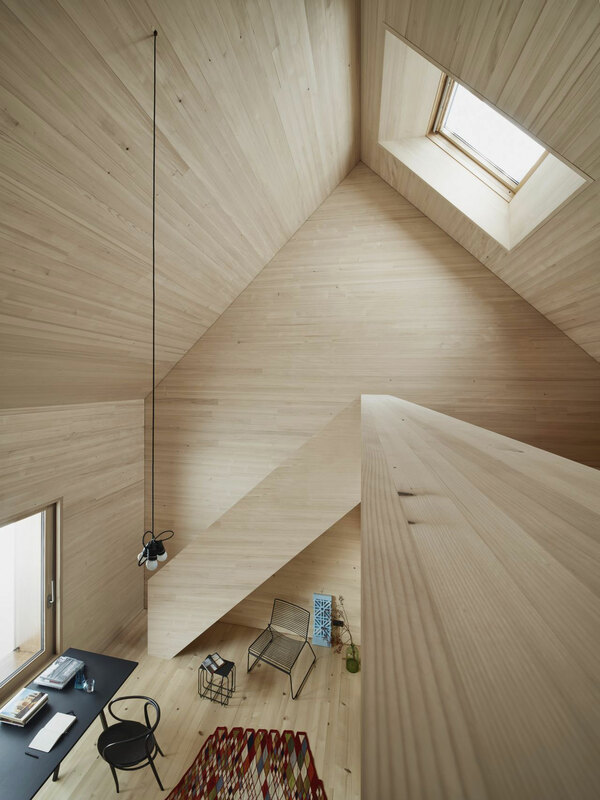 Based on the traditional houses of the Bregenz district, the two-storey residence has a simple triangular plan with a steep gabled profile and a wooden deck driven through its middle. Previously featured // Haus am Moor by Bernardo Bader Architects, Austria. 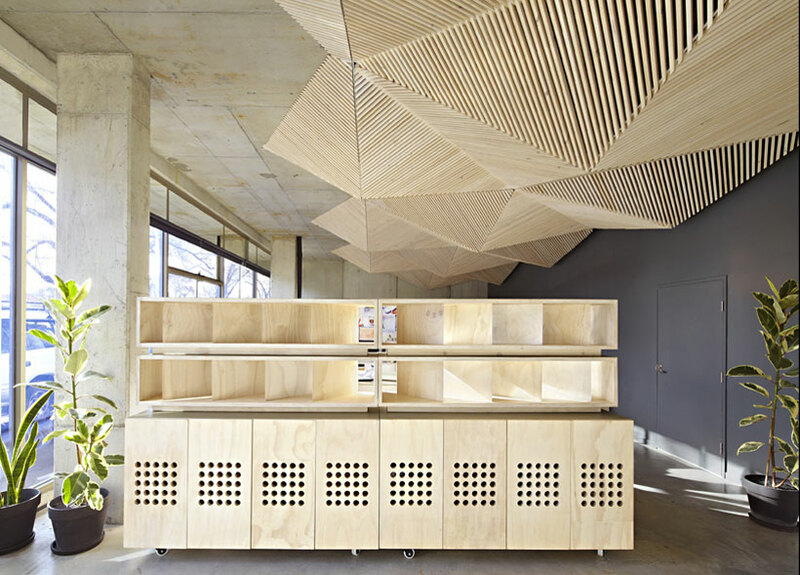 Gallery Post // Assemble Office in Melbourne. Triangles are wonderful, I keep coming back to them. 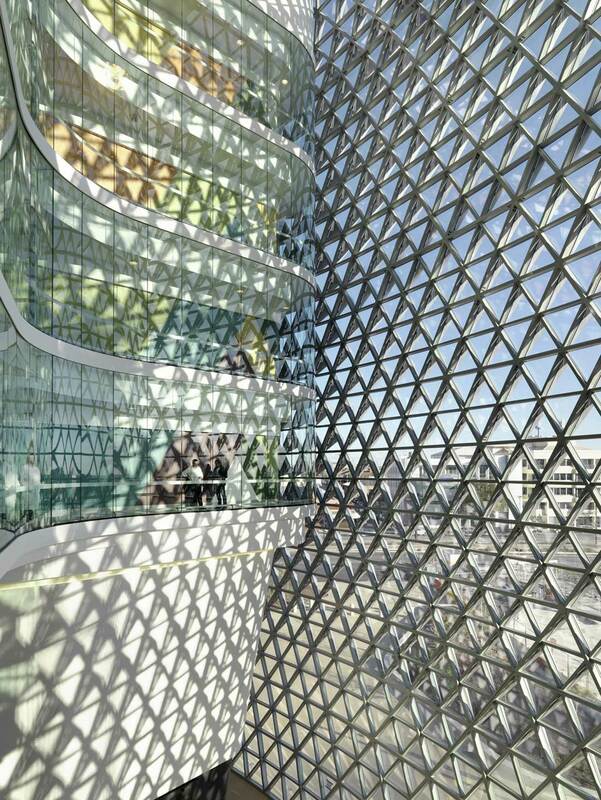 I’d suggest also Fed Sq as well, the external tiling pattern is based on a mathematically derived tiling pattern called pinwheel tiling. It appears random but the facades are actually pre-fabricated repetitions. It’s a delightful effect.